New UK car sales slump | What Car? 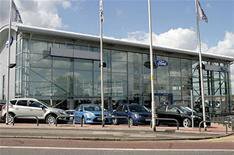 New car sales have dropped by 23.05% in October the sixth month in a row that figures have fallen. The new car sales figures for October show that just 128,352 vehicles were sold, a 23.05% fall from the same period in 2007. The drop in sales is the biggest decline since 1991 and the SMMT has said that the slump in new cars being sold could continue into the third quarter of next year. Among the notable big losers year-on-year were Chrysler, which sold 75.75% less vehicles, Renault, down 53.74%, Jeep, down 62.58%, and Alfa Romeo, down 42.95%. Jaguar, up 22.41%, Volvo, up 23.35%, and Dodge, up 10%, were the only listed car makers to post year-on-year sales increases. The figures show that 1.92 million new cars have been sold so far this year, down 8.7% overall on the same period in 2007. The slump in sales has been mirrored in the US and Europe. The American new car sales market was last month at its lowest since 1983. Toyota, the world's biggest-selling manufacturer announced its operating profit in the last quarter fell by 69%.